The effort we make –and our philosophy- at Dasokipos is focused on combining the truffle that our land produces with products unique in taste and quality that are carefully selected from all of Greece, without having one overshadow the other, but rather bring out the best in each other with regard to both taste and quality. In this area, surrounded by an old beech forest, we run our truffle and wild mushroom processing unit, using –once again – the Mediterranean sun as the sole source of electrical energy that caters for our needs. Even our need for water is covered by a borehole in our estate that draws from underground water deposits there. This is yet another element that makes the processing of our products unique, in that both the land and the water are free of any chemicals, and the energy we use is clean, something that cannot be seen but is definitely felt with all our senses. At a safe distance from industrial zones and pollution, we are happy to labor, showing love and respect towards nature, in order to provide the best our land can offer. 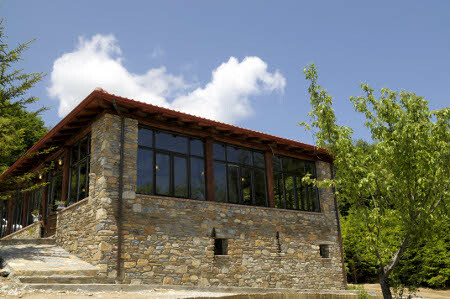 We have selected extra-virgin olive oil from the northern Peloponnese, which due to its geographical position – exactly in the middle of the Mediterranean – has its oil producing olive trees yield one of the noblest aromatic extra-virgin olive oils in Greece; so much as it is often used in blends to upgrade lower quality oil. 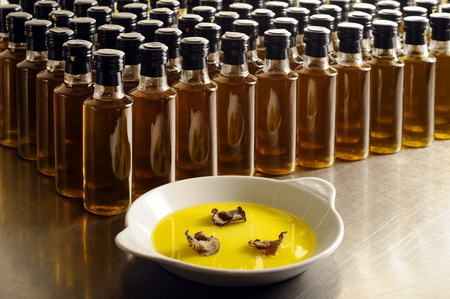 We combine this extra-virgin olive oil ‘as is’ with selected flavors and aromas of white or black truffle. This is evident not only by the aftertaste of this unique product, but also by its color (golden-green) and its behavior in cooling: products containing extra-virgin olive oil are much more likely to solidify. Our processing unit is situated on the second highest summit of Mt. Cholomontas, the tallest mountain of the Chalkidiki peninsula, at a height of 1150 meters and right across Mt. Athos of the Holy Athonite State. However, its distance from the sea, whose breeze spreads all over the mountainous region, is no more than 15 km as the crow flies. 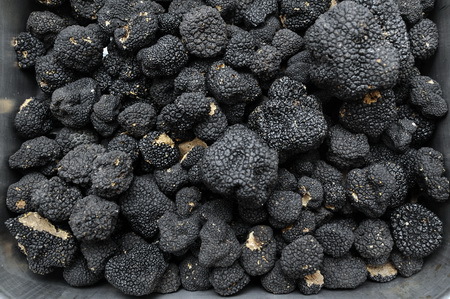 This combination gives us a unique Mediterranean micro-climate that comes from the swapping of drought and sudden rainfall, which is ideal not only for the quantity, but also for the quality and saturation of the aromas of the varieties of wild truffle that grows in these mid-zones and yield produce in various altitudes depending on the season and variety. 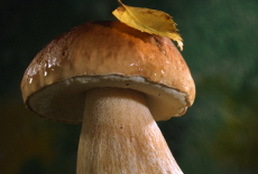 As for the wild mushrooms of the area, we could not be indifferent to the local varieties of Boletes, for example, which -due to the climate and the lack of constant humidity- produce unique aromatic καρποσωματα, just like the truffles mentioned earlier. When these appear, we harvest them with extreme care so as not to harm the mycelium that has a symbiotic relation with the tree roots and thus be able to allow it to yield production soon again. Then, we process them by freezing the smaller ones and drying the larger, more mature ones, which give the strongest aromas. In our estate, which is a natural wild mushroom production area, we constantly experiment on mycorrhizal symbiosis and increasing in the production of the boletus edulis and boletus pinicola-pinofilus varieties, as well as the spring white truffle (tuber borchii).